Happy Monday all! You're probably wondering how my dance event went, since I talked about that nervously on Friday, and I promise a full and fun recap tomorrow. Lots of amusing anecdotes! And I have a few photos to share. I thought first I'd talk about the rest of the weekend, as this was a jam packed one for my family! Got your tea or coffee? Let's settle in! 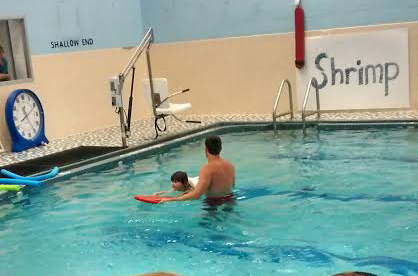 Yes, that is her, *actually* following directions and using the kick board! She did MUCH better, and looked absolutely adorable in her Elsa and Anna bathing suit participating in all of the drills that they did. Ten 4 and 5 year olds clinging to the side of the pool waiting their turn to swim across is a very cute sight indeed. So that worked out awesome. Saturday afternoon was the artisan market that my troupe danced at, and as promised, a full post on that is coming your way tomorrow. I'll just say that Saturday was one of the hottest and most humid days of the year so far, so let it be known that much discomfort was had by all dancers. But dance on we must! Saturday evening, Mike, Henry and I had tickets to see our local minor league baseball team play (the Triple-A affiliate for the Toronto Blue Jays, if you are into such things :)), and it was their annual Star Wars night. It sounds like an odd combination, but it really works. People dress up, a special video series plays on the big scoreboard between innings, and the players' photos are substituted for Star Wars characters. After my tiring afternoon of dancing, it was stupendous to relax and enjoy the game, eat a hot dog and have a beer. And they had a craft beer kiosk with a decent selection of local beers. Boom. 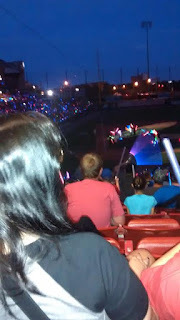 Not a great picture, I know, but it gives you an idea of how many people there were wielding light sabers. All of those blue and red lights in the stands along the side are light sabers. Very, very fun. "I didn't do anything! I didn't do anything!" And that's pretty much what we had going on this particular Sunday morning. Then, when it was time for Mass, Henry claimed to not be feeling good again. Let's insert a groan here, shall we? Henry is 9, he'll turn 10 this fall. It's the age, right? The age causing the reluctance to go to Mass, because "it's so boring!"? I mean, I know *I* felt that way as a kid, and I guess it was around that age, though it did start younger, which is the case for Henry as well. It's not easy to deal with, but I do my best. And happily, this is another instance of Mike being super supportive and backing me up about Henry attending. Per the two of us as a united front, Henry *will* go to Mass. But it certainly makes me feel bad when Henry expresses these things, and I wonder about the best want to handle it. Suggestions? Given that Henry's "ailment" came on so suddenly, he did not get excused from Mass. He came with us, and very unhappily so. Much whining and complaining in the car commenced. Luckily, our parish is only a few minute drive away, so my torture did not last long. When we arrived, after an excruciating extraction from the car, Henry was fine. He was polite and even reverent. But then Anne kicked in. Children's Liturgy of the Word is on hiatus for the summer, so she's with us the entire time. "Mommy, I have to go to the bathroom." "Honey, we just got here. Can't you..."
To the bathroom we go, TRIP 1 OF 2. Thereafter commenced 45 minutes of jumping, wiggling, climbing and all around non-stop activity that drained me of any scrap of energy I had left. So, you could say that it wasn't one of our easiest weeks at Mass. :) But we persevere! For those of you out there with suggestions on how to tackle this issue of kids not wanting to go to Mass, I'm all ears. Let's discuss in the comments! Our oldest is 8, so we have encountered some reluctance already in going to Mass. He received a small children's missal type book for his first communion, and for awhile he was content to read that during Mass. Do you have a religious book that he could read only during Mass that might help encourage him to go? He could follow along with the Mass in his own missal or at least read a religious story. I think it's also important to be consistent and make them go every week unless they are truly ill, which you are obviously doing already. If you give in and let them stay home just because they don't want to go, then the complaining will only get worse. CINDY!!!!! So excited that you commented, girl, can you tell? :0 OK, so this is interesting. 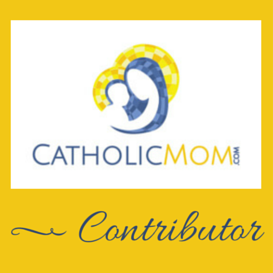 When he was around 6, I started a subscription to Magnifikid magazine for him, which is a weekly missal for children, and at first he loved that. For about a year/year and a half, that really helped. Then he started saying (so around age 7.5/8) that it looked like he had a "baby missal" and he didn't like using it anymore. He felt it made him stick out. I can understand such worries, so I got him an adult missal, the annual St. Joseph one. And the verdict was...eh. For a stretch, he'd use it every week, and it seemed good. Then he would forget it, or otherwise not want to bring it, and then he stopped using it. Occasionally he'll pick up the missal that is in our pew that the parish provides, but that's maybe 5% of the time. I recently got an email from Living Faith that they have a new children's missal coming out, for older kids, and I'm wondering if I should give that one a shot. Not sure if he'll consider that "stick out worthy" or what. :) I love to follow along in a missal, and he's a lot like me, so I keep hoping for a solution in this vein. I figured that you had tried this reading a book option already since you're a librarian and all, but I thought I would throw it out there anyway. ;) I would keep trying until you find something that he likes. That new missal sounds interesting; I haven't heard about that. My kids are 3 and 2 and our pew vibrates from the beginning of mass until the end due to the activity. Crawling under the pew, efforts to go over the back, up goes the kneeler, down comes the kneeler. Attempts at escaping into the aisle. We obviously have a long way to go in the sitting still department, so boredom hasn't really become a concern for us yet. Boredom is kind of a tough one, though, and very common. My parents would periodically offer a small treat or prize for being able to answer questions about the readings and/or homily and/or the order of mass. This strategy had mixed results, but was at least a reason to pay attention to mass rather than zoning out. I may have him take a look at the sample pages online to see if he would use it or not before I order it. But they claim that it is for older children, ages 7 and up. We'll see! Amy, nice to see you! First of all, nice to know that I'm not alone. :) What time do you usually attend Mass as a family, we can pray and offer things up for each other. ;-) And that is a very interesting suggestion on the boredom angle. I can see him paying more attention when our pastor does the homily (rather than our deacon, who is perfectly lovely, he just gives longer homilies) as he is short, sweet, to the point, and always starts with a funny/personal story. I was thinking that maybe it would be nice to find a small way for him to participate in the parish more, that he may take more of an interest. Like in the music ministry, they do have some kids. Last year, he wanted to be on the group that decorated for Christmas, and I'm sorry that we didn't end up going to that. This year I'll make a special effort to bring him for that. The other thing is whether he might be interested in any Catholic themed young fiction to read in his non-mass time? It might enhance his Catholic identity, in addition to trying to enhance his experience of mass. When I was a youngster, we had a few such books, including a young adult novel written by a nun that was kind of a Robert Louis Stevenson-esq adventure tale that included Catholic themes. As luck would have it, for the life of me, I can't remember title or author. I'll look into it and see if I can find it. I'm just trying to think what I will be doing in another 5 years or so. Amy, 10 am Mass over here. Solidarity, sister! I know I might get some beef for this mass suggestion as it's kind of controversial and you can ignore me BUT you might look to see if there is a teen/lifeteen mass on Sunday evenings at a parish in the area. You don't have to go all the time but once in awhile maybe go to give Henry a new feel for the mass with different music and usually the homily is more geared for younger kids. It might be good to give Henry a different perspective of the mass. When I was a teen I was introduced to this new mass and it changed the way I looked at my faith in a good way..even though there is a lot of controversy on the topic..just my 2 cents. Even though it's a teen mass anyone can go. Hi Beth Anne, thank you for the suggestion! I've never seen one in our area, but I've never really looked either. So you never know! ...and like I mentioned, I purchased the dark green, traditional missal. This is different from the St. Joseph missal we tried in the past, so maybe a different one will inspire him? We'll see, and I'll keep you posted!